The wedding reception is about more than just the food, it’s the first chapter in a marriage—the tableau, menu, and cocktails should reflect that bliss. More and more brides are slipping into something new post-ceremony for their reception. Whether it’s a pant suit, separates, a leather jacket, or something she can really dance in, the second look lets a bride be playful, fashion-forward, and even add a pop of color. Curated ideas from real weddings that will make you swoon. Who says you can’t use all the colors when it comes to a wedding palette? 10 easy life-hacks for feeling your best on the big day—and beyond. Whether you’re reaching for food at your rehearsal dinner or dessert on your wedding day, it’s a great opportunity to show off that bling. How one married couple has transformed the wedding rental business. A guy’s guide to all the best places for revelry, drinks, music, and sport. An atelier filled with love, light, and fabric. Engagement photo ideas—playful, fun, and real—that kick boring to the curb. These liners will leave your wedding guests with no doubt where they are heading. Geographic envelope liners give an invitation context and can be a playful nod to a couple’s favorite city. Here are loads of locally sourced ideas to fill your welcome bags. Six charming weddings that will make you swoon. 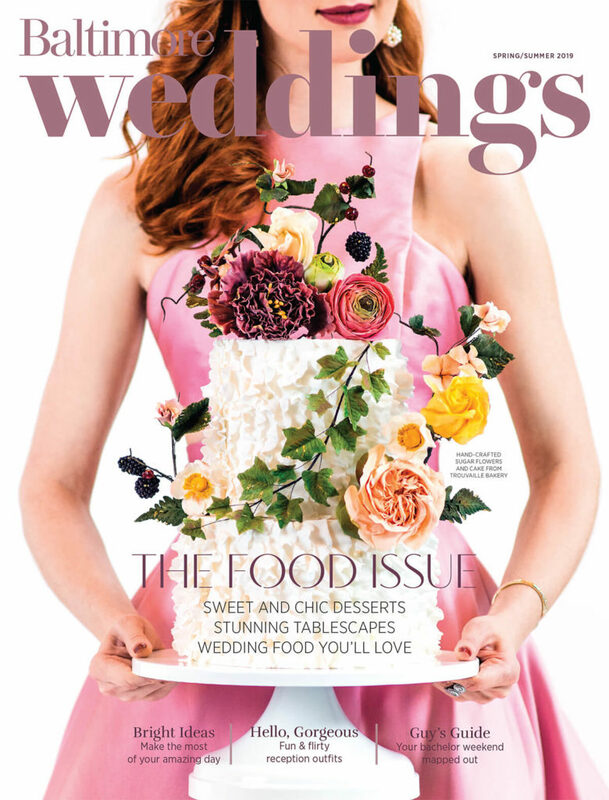 Trends may come and go, but food will always be central to wedding celebrations. How one couple got married in the middle of Ellicott City’s devastating flash flood. The heart, art, and hard work behind wedding flowers.